The following is excerpted from the Deseret News. Jim Hayes had tried to find his biological parents for decades. 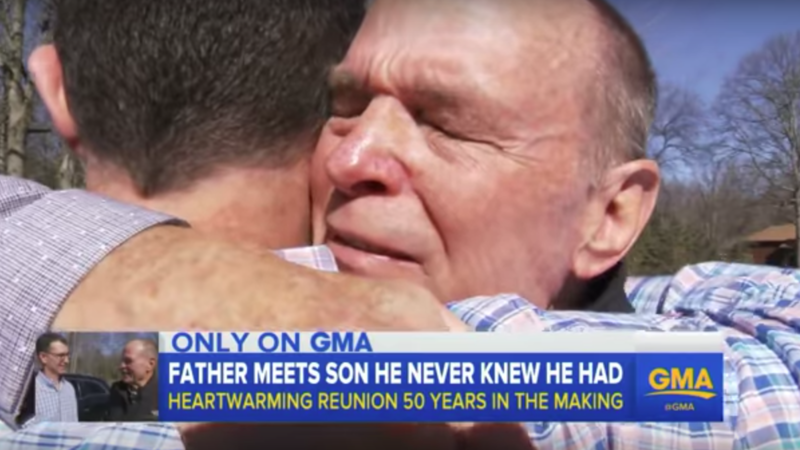 Despite some roadblocks, it was finally an Ancestry.com DNA test that brought Hayes and his father together for the first time in 50 years, according to ABCNews.go.com. Their meeting in April involved heartfelt hugs and tears of joy. “You have a child for 50 years and didn’t know about it … it’s kinda like ‘Wow,'” Nuveman said. Hayes grew up knowing he was adopted and became curious about his biological parents in his 20s. The adoption agency could only give him limited information about his mother. When he reached out to her she declined his request to meet. Watch the full video from Good Morning America below and read their full article HERE. For every story about a happy reunion I'm sure there's one like in my family, where a young woman surrendered a baby for "closed adoption" through LDS Family Services, only to have the child try to contact her by contacting every blood relative the Ancestry DNA test linked to her (even though the mother did not want contact). This had the effect of literally exposing the entire family to sensitive issues from the past. The privacy issue is huge, because we can avoid submitting our own DNA, but all our blood relatives' DNA can point to us, whether we ourselves submitted to DNA tests. Look at recent cases in the news of false criminal accusations made against innocent people based on family members' DNA. For every Golden State serial killer there is a SWAT team at a nursing home of an innocent man. In the story above, the mother of this man didn't want contact, and was probably expecting privacy until massive DNA testing came along.